It is a truism that if one were to give the same basic story idea to a dozen writers, each would come up with a completely different interpretation of the idea, and the end result would be a dozen very different variations on the same theme. 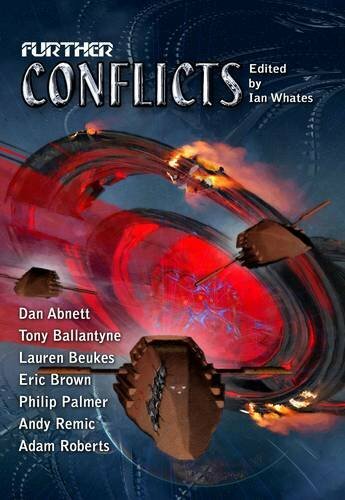 Thus we have Newcon Press's Further Conflicts , an anthology of SF short stories about war. Further Conflicts does not attempt to define a genre or make any particular point about war or the way war is dealt with in SF, but rather to allow its thirteen authors to ring the changes on war as theme, setting, and subject matter. As might be expected, the thirteen stories in the collection are wildly diverse, varying enormously in style, tone, and (unfortunately) quality. Beyond the broad remit of the anthology's theme, the only unifying element is a certain pessimism, a dark outlook on the various futures and worlds depicted. Perhaps this is unavoidable, given the theme: the belief that "war is hell" is now so deeply entrenched in Western culture that it would be strange if an anthology of war stories was not dark, somber, and depressing. The theme of war's hellishness is one of the most well-worn in literature, and one of the hardest to make fresh and interesting, so it was encouraging to see the anthology open with two stories on that very theme that are striking, eloquent, and memorable. Dan Abnett's "The Wake" takes place among soldiers, in the midst of a war they take for granted and don't bother to explain. Abnett keeps the narrator's first person point of view very tight, so that his world is evoked rather than described, with the focus of the story being the weird events at a wake held for one of the members of his company. There are horrors on the battlefields of this war, but Abnett's protagonists are ordinary decent soldiers with a job to do and a position so low in the command structure that they have very little control over what that job is and how to do it. The horrors that are purely external in "The Wake" are internalized in Lauren Beukes's "Unaccounted," a story inspired by the tortures committed at Abu Ghraib. Beukes's story, like Abnett's, takes place during a long-established war between humans and aliens, but although Beukes's soldiers are ordinary, they are not decent: the war has twisted them up inside, and made them cruel and heedless. Although both writers manage to suggest the existence of a wide world beyond the borders of the story with a few economical strokes, Beukes is better than Abnett at making that world convincingly different from the world as we know it. Abnett focuses so closely on the effects of war on soldiers that the nature of the conflict and the enemy almost seems incidental; the "Scaries" are horrifying, but (we are invited to think) not more horrifying than the uncaring bureaucracy that sends men to die (or worse) at their hands. Beukes likewise zeroes in on the effect of war on the minds of soldiers, but the perspective taken in "Unaccounted" (that of an inspector required to keep records of materiel), allows for a little more distance. Beukes's aliens are truly other, so far removed from humanity that it's easy to see how human soldiers might see them as fair game for any kind of treatment. Despite this, there is no question that they are perpetrating horrors. Like "Unaccounted," Tony Ballantyne's "The War Artist" features a character half in, half out of the conflict, who observes it from a distance, not taking part in the awful events he witnesses but powerless to change them. Unlike "Unaccounted," "The War Artist"'s narrator has a vantage point that allows him to see something of the rationale for the war as well as the horrors on the ground, and as in "The Wake," the picture it paints of the decision-makers is a bleak one. Unfortunately, the story is undermined by the implausibility of the basis for the war. Would the erasure of all digital information by hackers really be enough in itself to cause civilization to collapse, to the point where the countries unaffected by the attacks would feel justified in intervening with troops? It's an interesting premise, but it feels too flimsy a pretext for the chaos described; social bonds and habits are a lot more resilient than that. Gareth L. Powell's "The New Ships" and Colin Harvey's "Occupation" both feature an Earth invaded by a vastly superior alien force. "The New Ships" asks questions about ends and means, and turning into the monsters we are fighting, but it is sadly unremarkable, entertaining enough while it lasts but easily forgotten. "Occupation," in contrast, is a striking and poignant tale of a doctor determined to hold on to the tenets of the Hippocratic Oath even though his patient is a member of the alien race that have occupied Earth. His situation is grim, and it's a challenge to hold on to hope. This is a common theme in this collection; for instance, in Adam Roberts's tense and claustrophobic "The Ice Submarine," the only hope available is that offered by religion. The crew of the titular submarine are officers serving the "Pan-Islamic People's Republic," and their discovery of an anomaly at the South Pole is more baffling than enlightening. The war they fight is a distant yet ever-present reality, constraining their actions as much as the ice they tunnel through. Not all the stories concern themselves with the horrors of war as such. Eric Brown's "The Soul of the Machine" and Tim C. Taylor's "Welcome Home, Janissary" are each, in their different ways, meditations on what it means to be human, with "The Soul of the Machine" contrasting human nature with that of an android, while "Welcome Home, Janissary" compares standard humans with those who have been enhanced and manipulated by humanity's alien overlords to have uncanny powers. "Welcome Home, Janissary" is the more successful of the two. According to Taylor's author biography, he is working on a novel connected to the story, which may account for the richness and depth of the worldbuilding and the care taken in characterization. "The Soul of the Machine," while decently written, comes across as shallow by comparison. Three stories in the collection use unusual narrative tricks, the most subtle being the slight unreliability of the narration in Steve Longworth's "Extraordinary Rendition," a rather frustrating story. The twist that it ends with is genuinely clever and well-executed, and the atmosphere evoked is convincingly claustrophobic and oppressive. But the story is let down by its superficial treatment of China. The argument Longworth puts into the mouth of Li the rebel—that Chinese investments in African countries are predatory in intent and will result in those countries being effectively enslaved to China—is one that has been put forward by Western commentators. That doesn't mean it's not true, although it has a whiff of Yellow Peril paranoia about it, but it's hard to take Li seriously as a former Communist Party apparatchik when his dialogue reads like it could have been taken from the pages of The Economist . This superficiality in Longworth's treatment of his setting is made more glaring by a kind of tone-deafness in the language used. Longworth seems to forget that his two main characters are speaking Chinese; there is an excruciating pun on the final page—a pun that could only work in English—and at one point, he has the interrogator Huang say "You always went the extra li" (p.147), which is neither good English nor good Chinese. Dropping a Chinese unit of measurement into an old English saying (and one derived from the Gospels, at that) does not make for natural-sounding dialogue. Philip Palmer's "The Legend of Sharrock," by contrast, succeeds brilliantly in conveying the impression of a report from inside a culture very different from our own. Written from the point of view of a member of a long-lived species with an overpowering warrior ethic, the story has the feel of an ancient myth retold, familiar and resonant despite the many explicit and implicit indications that Sharrock's people are not even close to human. It is easily the best in the collection, although Stephen Palmer's "Brwydr am Rydidd" gives it a run for its money: it employs a nested narrative chiefly told in one voice but continually interrupted by historians and archivists of later ages, disputing the facts that voice relates. It's cleverly done, and the future Wales seen here is weird enough to be interesting without being so weird as to be incomprehensible. The story takes tropes from fantasy and ghost stories and science-fictionalizes them, to great effect. Despite the presence of a few mediocre or disappointing stories, Further Conflicts only has two that are outright bad—Kim Lakin-Smith's "The Harvest," with its ludicrous video game-style action sequences and wildly implausible backstory; and Andy Remic's "Yakker Snak," which tries very hard to be funny and fails drastically—and the good stories are very good indeed. Still, two bad stories out of thirteen is two too many. This makes evaluating the collection as a whole rather difficult. Does the presence of several very good stories make up for the inclusion of the bad ones? Do they average out to a passing grade? The diversity of ideas and techniques on display is impressive, and if Further Conflicts were intended as a snapshot of a burgeoning new genre, I would say that genre had a bright future, because even the bad stories have a degree of energy and inventiveness that is cheering to see. But "SF about war" is not a new genre, and Further Conflicts has no such pretensions. Considered simply as a collection of stories, Further Conflicts is too uneven to recommend without a caveat: depending on the reader, the highs may not be worth the lows.